A residential green roof can lower urban air temperatures and reduce energy demands and CO2 emissions. Here are six varying examples of green roofs in Australia. Although we are still playing catch up with America and Europe, incorporating green roofs in our buildings is not a new concept for Australia, with issues such as cost, weight and drainage also needing to be considered. Here, the bulk of work has been concentrated in urban centres, particularly in Melbourne, Adelaide and Sydney. Progression to other capital cities has been gradual, but taking place. According to a report by the Rural Industries Research and Development Corporation, titled ‘Living Wall and Green Roof Plants for Australia’, green roofs in the built environment offer significant triple bottom line benefits. Firstly, they help to lower urban air temperatures and ameliorate urban heat island effects, which occur when generated heat is absorbed by the buildings, pavements and vehicles in cities. A number of studies have shown that green roofs can prevent excessive heat gain and act as a passive cooling agent. For instance, a 2005 modelling study for Toronto, Canada, predicted that adding and irrigating green roofs to 50 per cent of the available surfaces downtown would cool the entire city by two degrees Celsius. 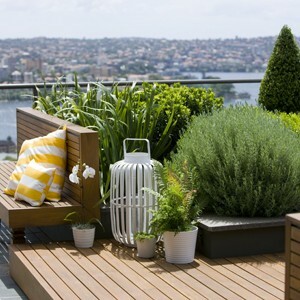 Rooftop gardens also lessen energy demands and attendant CO2 emissions in a variety of ways – they can help improve a building’s insulation, reduce cooling and some winter heating costs, as well as lower the electromagnetic radiation from other buildings, which increases solar panel production. Lastly, green roofs have been proven to improve the wellbeing and productivity of citizens, whilst providing habitat for micro and macro organisms. These benefits, however, are not simply accessed by slapping a patch of grass and planting some shrubs on desolate roofs. Choosing the right plants so the green roof flourishes is essential, with some species performing better than others in certain climates and areas. Product selection also plays a big part in ensuring the green roof remains low maintenance but long-lasting, while weight loading issues of the roof membrane must be considered from the very beginning. Located on the edge of central Sydney, the Prince Alfred Park Pool green roof was designed in response to the creation of a new services and pool facilities building and pool concourse. The design team wanted the new building to be as discrete as possible. In response, they came up with a ‘folded landscape’ strategy, whereby meadows of native grass in the park have been ‘folded over’ the pool facilities to create a rolling park landscape. “The green roof was a direct result of an urban strategy about the park. Folding a park over the building enabled us to minimise the impact the building had on the park,” said Rachel Neeson of Neeson Murcutt Architects. With landscape premiated over built form, the design of the 2,320sqm green roof – the largest of its kind in Sydney – has evolved beyond a meadow camouflage. According to landscape architect Sue Barnsley, Tensar geogrid SS30/30 + SS20/20 was used as the soil stabilisation layer, and the geofabric was Bidum H34 and A384. BASF Conipur M865 Thix membrane and BASF Sonoguard Top Coat, a moisture-cure polyurethane waterproofing membrane system, have been used in the project to ensure structural integrity is not compromised by the roof garden. Bentofix waterproof membrane and Bentonite water proofing mass were also utilised to achieve long term protection against water ingress. Although the greatest design challenge for the team was making the 1,000m2 pool building disappear in the park landscape, the precise alignment of the folding perimeter fence across a sloping ground line also proved a challenge. Stainless steel mesh fencing from Ronstan has been used here, winding like a ribbon in the landscape, up through the meadow and over the green roof. Bringing nature to the city, the green roof at Prince Alfred Park successfully conceals the presence of the building from Chalmers Street, while creating an urban habitat, and amplifying the pastoral quality of the landscape. On a larger scale, the landscaped roof gives back to the city, continually transpiring, oxygenating its surrounds, cooling and humidifying the site, and sequestering carbon. The Westbury Apartments is an inner city art deco apartment block built in the early 1930s. A 2010 rooftop garden makeover by Atlantis Design, however, has given the building a new lease of life, although the design remains sympathetic to the building’s heritage interior. “We aimed for a relaxed suburban backyard feel that was well-serviced for entertainment, but had virtually zero maintenance requirements,” said Mark Harper, principal of Atlantis Design. Life-like synthetic lawn was installed adjacent to the swimming pool and clothes drying area, with elevated granite stone pavers protecting the underlying roof membrane and providing enhanced thermal insulation to the building. Elmich Australia’s VersiPave was also used. Manufactured from recycled plastic, it eliminates the use of bedding sand or screeds. “This is a major benefit resulting in significant weight reduction on The Westbury’s building structure,” said Harper. Other products utilised includes the Evalon sheet waterproofing membrane supplied by Green Roof Technologies, which is highly resistant to UV and plant roots, and Elmich’s VersiDrain 25P which were installed in shallow planted areas. These drainage and water retention trays lie beneath geotextile and lightweight growing media and plants, keeping them well hydrated while preventing damage to the underlying waterproof membranes. Additionally, VersiCell drainage cells have been installed at the base of deeper planter boxes. Made from recycled plastic, these cells work to allow the dispersion of excess water, and can withstand heavy loads such as large trees. Winning the 2013 BPN Sustainability Awards – Multi-Density Residential category, ANU’s Lena Karmel Lodge by Nettleton Tribe is located on an island site surrounded by busy roads, and features an edible garden and green roof. “The roof garden is a counter-balance to the busy city life and transport interchange below,” says architect Trevor Hamilton. Located on two wings, the first part of the green roof is predominantly a native garden, with irregularly shaped planting beds that reflect the landscape of Black Mountain in the distance. The second is a production garden, with a garden shed and highly structured plots to reflect the more classic vegetable garden. It is in this wing that students can plant and harvest fresh, seasonal produce for their own consumption. The planter boxes are Corten, with Parchem’s Index Fidia and Index Testudo Mineral – elastomeric, torch applied membranes that are reinforced with a non-woven polyester stabilised with glass mat – used as the waterproofing membrane. Spotted gum decking and a generic grey concrete paver on Versijack support have furthermore been used along the floors, with a stainless steel and glass balustrade offering occupants views of the campus and site. What sets this green roof apart is that it not only contributes to a more sustainable environment, but also facilitates educational value: it creates awareness on resource production, and seeks to modify the behaviours of students. Sitting stories above the ground, this inner city rooftop garden offers its residents views of the city, and affords the built environment around it a way to combat UHI effects. The design of the garden is formal in its approach, staying consistent with the architecture of the building, as well as in line with the client’s tastes. Bexus hedging and topiary cones create clean lines, while the introduction of iris and lavender have softened the formal aspects and added a whimsical effect. According to Matthew Cantwell, director of Secret Gardens, the existing tiles on the balconies, as well as the external architecture of the building, could not be modified, so all materials and plants selected had to be complimentary to what was already there. The design strategy also had to cater to the fact that everything on site had to be brought up in a lift. Summer prestige from Grassman, a thick and soft artificial turf that does not require watering, has been used in the garden, ensuring low or no maintenance and reducing the amount of water required. Conversely, the garden beds run on a drip irrigation system. The plant beds were designed to be less than 300mm, with Elmich VersiCell drainage cells selected for the planters to create a cavity for water flow. Allowing the height of the soil to be determined, these drainage cells act as the main weight-reducing elements. Another green roof example is the podium roof deck on the third floor of Mirvac’s Edge Towers in Melbourne, which required a decorative, non-reflective finish. A green ‘roofscape’ was designed by landscape architects Edaw Gillespies Melbourne to provide residents in the high-rise apartments with an aesthetically pleasing outlook, as well as deliver the recognised physical and climatic benefits associated with green roofs. As the green roof was not intended for heavy foot traffic, the materials chosen behave as a form of roofing material, and had to be durable and low maintenance. Here, DecoR Stone’s DécoR Pebbles in white, black and claret red colours have been used extensively to provide relief to areas planted with low maintenance species. The manufactured pebbles are from the ‘Enviro’ selection of re-used pebbles. DécoR Glass, a coloured crushed recycled glass, was also utilised, providing the architects with a range of standard and metallic colours that have enhanced the rooftop design. Geometric patterns of the pebbles and glass were laid in epoxy resin in a 20mm thickness on top of a 100mm bed of crushed rock, with a PVC drainage mat laid on to the waterproof membrane prior to the crushed rock being installed. The largest installation of green roofing in the Southern hemisphere is the Victorian Desalination Plant Green Roof in Wonthaggi, Victoria. At 26,000sqm, the green roofs integrate landscape with architecture, helping to mitigate the visual impacts of the environmentally sensitive coastal site. Blending in with the surrounding landscape, the roofs store and clean rain water, while providing acoustic and thermal insulating properties for the buildings they sit on. Various parts of the overall growing profile utilise recycled products. For instance, recycled timber chips were incorporated as a light weight alternative to straight soil in the thin layer of growing media, along with recycled geo-textile materials. In addition, the planting design uses only local indigenous species that will provide habitat for birds and insects, contributing to the biodiversity values on the roof, and assisting the on-ground ecological restoration of the site. The green roof also showcases principles of Water Sensitive Urban Design (WSUD), and is designed to cope with the hot-dry conditions of south Australian summers.